Moonbird is a progressive rock project originally created in 2004 by multi-instrumentalist and lyricist James Kwiecinski, and lately in collaboration with friend Daryl Lynch. Mr. Kwiecinski is quite prolific: this is the seventh Moonbird project in six years. To musical style, Moonbird is reminiscent of Pink Floyd, Peter Gabriel, a little Fripp, Eno, and maybe some Genesis (early) here and there. The music isn't eclectic as that sounds: generally, there's lots of atmosphere or ambience from keyboards that are often quirky or trippy; and solid acoustic and electric guitar work that could remind of Floyd at times. It's a conspiracy of sound really. But that makes perfect sense because James Kwiecinski is a lyrical conspiracy theorist hoping to make social and political commentary. Humans is a concept album about the human condition, and the condition is not good. From the promo material we find this, 'the world is run by handful of ruling elite who dictate how our lives will go and we are enslaved by them. Because of this there is much war and extreme poverty in the world.' I knew it: 'they' are out to get us. So, on Humans 'the focus is entirely upon the theme of the human condition: humanity seems to be at a crisis point and the underlying issues must be found and dealt with.' Now, there's a brainstorm. Mr. Kwiecinski is quick to point out what he believes those issues are, but very short on a remedy. The despairing human condition arises, essentially, from the wrongs done to us by the global political, economic and environmental co-conspirators as revealed in song on 'Humans,' 'Full Spectrum Dominance,' 'We Own You' and others. Oh yeah, the other major conspirator is organized religion; and, of course, that means bashing Christianity on the lengthy piece, 'Memorial.' Sometimes, as on Greed And Ignorance, Kwiecinski gets closer to the fundamental problem underlying all these things which is, and sorry to get theological here, man's original sin and corruption. Musically, Kwiecinski (and Lynch) are at their best when they are at their worst. Despite the abundance of vulgarity and angstful whining, the Floydish 'Full Spectrum Dominance,' 'Somebody Tell Me,' and the up tempo rocker, 'We Own You' are some of the best compositions on this disc. Even 'Memorial,' with it's eerie voiceover from a fundamentalist preacher John Hagee and undeserved Christian bashing, is an impressive arrangement. Unfortunately, combining good art with a suspicious, unsubstantiated or simply bad message, does make the music profound. Moonbird's Humans is a complex, but doubtful, conspiratorial tale of the human condition set to similarly complex, and sometimes pleasing, progressive rock. 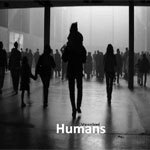 Humans is a lot to work through, but if you can pass over the questionable political themes with its unnecessary vulgarity, you will find some interesting music here.